Caroline Danella Hewitt was born in Barford on the 28th July 1872. Her father, John (1832 – 1876), a tailor, married Caroline’s mother, Harriet Wells (1840 – 1917) on 11th February 1862 at St Peter and Paul’s Church, Aston, Birmingham. Harriet was born in Compton Wynyates, Warwickshire. When John died from a riding accident in 1876, he left Harriet alone to bring up four young children. Caroline was the second youngest child, Mary Elizabeth (1863 – 1934) was the eldest followed by Frances Henry (25/6/1865 – 1914). Next came Ida Hannah (27/2/1870 -), Hubert (5/1874 – 1936) was the youngest. Ella was born in 1867 but died in 1871. John’s father James was also a tailor and they were in business together. They lived and worked in the cottage next to the Granville Arms, on the Wellesbourne Road. 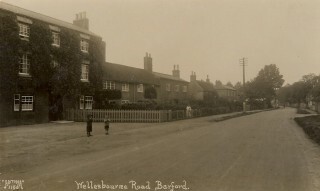 From newspaper accounts John tried to sell the family property in Barford in 1868. When John died in 1876 Harriet took over his tailoring business. She is listed as a tailoress in the Kelly’s Trade Directory of 1876. Local newspaper reports from the period suggest that Harriet had difficulty securing payment for her work and struggled to look after her family. In 1879, Ida Hannah was placed in an orphanage in Wolverhampton but later found work as a nurse in Towcester. In the 1901 census Harriet is living at 71 Wellesbourne Road with her blind mother, Susannah Wells, who was then aged 91. In the trade directory for 1905 Harriet is listed as still living on the Wellesbourne Road with her son Henry, who was a joiner. There are newspaper reports of Harriet appearing in Barford village dramatic presentations at this time and she received good reviews. By the 1911 census Harriet had moved to London, living at 54, Burrard Road, West Hampstead, London. Harriet occupied the ground and first floor of this building. Caroline travelled from Southampton to America on the 15th May 1897. She is listed as a passenger to the USA again in 1907. This time she travelled as a governess to the family of Mr Carhart of Tuxedo Park, New York. She is described in the ship’s manifest at 5′ 6” in height, fair complexion, brown hair. grey eyes, town of origin, Barford. One year later she travelled to New York again, this time as a teacher to the children of William Hoffman, also of Tuxedo Park. Immigrations records tell us that Caroline returned nearly every year to England, presumably to visit her mother and other relatives. 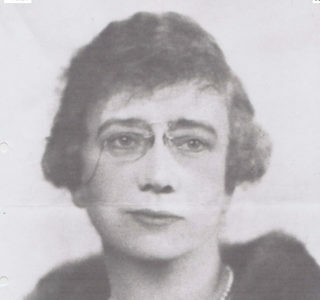 Caroline founded the Hewitt School in New York in 1920. She had sought out benefactors to help with finance. Caroline had a passion for theatre. Drama societies have always been an important part of life in Barford. Stratford upon Avon, with its world class Shakespeare theatre, is only six miles from the village. Caroline loved the works of William Shakespeare. In the words of one of her students; ‘Here was a personage for whom we felt worshipful respect and fear, yet when reading Shakespeare her voice would tremble with emotion and her eyes grow moist in sorrow.’ Miss Hewitt tolerated the teaching of biology and chemistry at her school with science experiments having to be conducted in the basement while she was out! Generations of girls recall Miss Hewitt reading Shakespeare in her wood-panelled dining room at a big mahogany table. She read ‘Wind in the Willows’ to the younger children. She encouraged her students to write and perform in their own plays. On Shakespeare’s birthday, 23rd April, Miss Hewitt would bring her students across to Central Park to lay daffodils at the foot of Shakespeare’s statue. She was a member of the Shakespeare Society of America. The mascot of the Hewitt School is ‘Harriet the Hawk’, probably named after Caroline’s mother. She did not forget Barford! 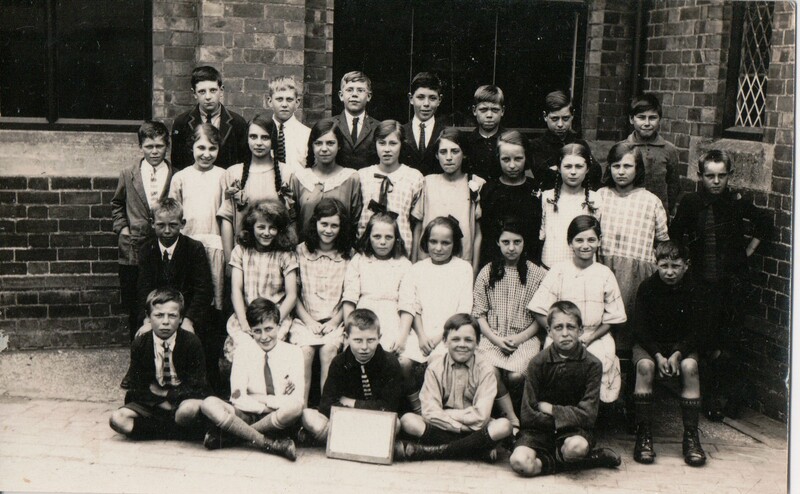 On her visit to Barford in 1928 Caroline founded a scholarship at secondary school for a promising pupil of Barford school whose parent’s circumstances precluded the expense of a higher education. The gift was in affectionate memory of her mother, Harriet. The only condition of the trust was that the scholar, for the time they had the scholarship, would place a wreath of primroses on Mrs Hewitt’s grave on the 23rd of April each year. Barford School Headmaster recommended and Miss Hewitt accepted Berta Smith as the first scholar. Kathleen Webster and Mary Hunt were also recipients. Norman Gardiner, in his reminiscences states that he, too, was also fortunate to receive this scholarship. He remembers that it meant that he had to keep the grass cut and wash the Hewitt headstone. 1938 Miss Hewitt took the upper classes of Barford School to see ‘As you like it’ at the Memorial Theatre in Stratford upon Avon. Caroline continued to visit her family in England until the late 1950s. They remember her as Aunt Carrie, or as ‘she who must be obeyed.’ The family were required to undertake chauffeuring duties during her trips back to England. It was a terrifying task for her young niece to be asked to read a column of a newspaper aloud to her. Miss Hewitt would take her relatives out to lunch but if one did not deal with the pips from the cherry pie correctly, one would know all about it! The Hewitt School educated some famous ladies, including the children of Lord Louis Mountbatten, Christina Onassis, Dodie, daughter of Edsel Ford, actress Julie Harris and daughters of the Astor, Vanderbilts, Pulitzer families. It is still thriving. A photo of Miss Hewitt appears on the school website. Caroline Danella Hewitt died in New York in 1961. She is buried next to her mother Harriet in St Peter’s Churchyard, Barford. Before her death she posted her obitutary to the New York Herald Tribune. An article about her appeared in the famous Time Magazine on the 7th of July, 1961. She is possibly the only person from our village to merit this accolade. In this article she is described as ‘proper and English’. She drank Scotch whisky. She considered herself too plain-looking for acting a friend said ‘she looked like Churchill and when she got mad, like Queen Mary!’ She is described as ‘cheerful, wholesome, stern, energetic and just a bit theatrical’. Very Barford, in other words! She was a truly amazing lady who never forgot her native village. References: We are especially grateful to Lynette Smith for permission to use this photograph of Caroline D Hewitt, for letting our Heritage Group have her copy of ‘By faith and courage’ – a history of the Hewitt school, written by A E Edwards and published in 2010, and for her personal reminiscences of Caroline Hewitt. We would like to thank Jan Bradley for sharing her reminiscences and photos. Jan’s Mum was a friend of the first recipient of the scholarship, and Sheila Reynolds for her memories of the Hewitt scholarship recipients. We would also like to thank Brenda Semple. Ancestry.co.uk, British Library Newspaper Archive, reminiscences of Norman Gardiner, Barford Heritage Group Archives.Time Magazine archives, July 7th 1961, Warwick County Record Office.